Our team of professionals helps qualified individuals and families obtain second citizenship in Dominica! Established in 1993, the Dominica Economic Citizenship Program legally offers individuals and families worldwide an irrevocable second citizenship and passport in only four to six months with no visit to the country required. The Caribbean island nation has an excellent international reputation, and consequently, the Commonwealth of Dominica passport provides visa-free or visa on arrival access to more than 115 countries around the world including the entire European Union, Switzerland, UK, Singapore, Russia, Brazil, and Hong Kong. The Dominica citizenship through investment program is legally entrenched in law, and since local law does not contain any restrictions on holding dual nationality, obtaining second citizenship by investment in the country is a confidential process that does not require a person to renounce their existing citizenship. In addition to having no physical residency requirement, the Commonwealth of Dominica citizenship by investment program has no language, age, business experience, or educational requirements, and there is no mandatory interview. The economically secure country with a parliamentary democracy enjoys one of the highest standards of living in the Caribbean, has no taxes for non-residents, boasts the lowest crime rate in the entire region, and is arguably one of the most naturally beautiful places on earth with lush green mountains, countless pristine rivers and waterfalls, and stunning white and black sandy beaches. Best of all, the Commonwealth of Dominica offers the cheapest citizenship by investment program in the world with reputable second passports starting at only $100,000 USD. UPDATE: The cost of citizenship in Dominica will remain unchanged until at least 2019. The Caribbean citizenship program's investment criteria were originally scheduled to increase significantly in August 2016, with the minimum price of a Dominica passport rising 75% to $175,000. This major cost increase has now been put on hold indefinitely, so if you are interested in becoming a Dominica citizen, we encourage you to act fast. Section 101 of the Dominica Constitution and Section 8 and Amendment 20(1) of the Citizenship Act define the investor program in law, legally granting eligible persons instant citizenship in the country by a Certificate of Naturalization. The Dominica Citizenship by Investment Unit (CBIU), a recently established Government authority within the Ministry of Finance, enforces all regulations under the passport program and is the regulatory body that ensures only worthy applicants are accepted. In order to be considered eligible, the main applicant must be at least 18 years of age and must meet all the Dominica immigration requirements outlined below. The Dominica Economic Citizenship Program will only accept individuals of outstanding character and repute. To ensure only credible persons of impeccable standing are given citizenship, the Government of Dominica has a preeminent private investigative agency perform a comprehensive due diligence procedure on all applicants older than 18 years of age. Dominica is committed to an exemplary standard of due diligence to protect the integrity of its citizenship investment program, and only individuals with no criminal record and whose funds have been legally derived will be permitted to acquire citizenship in the country. In order to be approved for Dominica nationality, applicants should have excellent health and must show that they do not suffer from any contagious diseases. To be eligible for Dominican citizenship by investment, a candidate must either make a significant economic contribution to a Government Fund or purchase approved real estate on the island. In both cases, the applicant must officially commit to making the investment before applying to the investor program, but does not actually have to pay in full until after approval in principle. The Dominica Government Fund finances public and private sector projects in the country in an effort to increase national development and support the islands social progress and financial security. Public sector projects identified for financing by the fund include renovating the local hospital, building new schools, constructing a national sports stadium, and promoting the Island of Dominica offshore industry. Private sector projects financed by the fund primarily focus on advancing the nation's information technology, tourism, and agricultural sectors. These contribution amounts are significantly lower than other citizenship by investment countries in the region with comparable passports. The Dominican Economic Citizenship Program offers astounding value to its participants, and no other reputable investor citizenship program has such affordable investment criteria making Dominica the cheapest citizenship by investment program in the world. The cost to become a Dominica citizen will likely increase substantially in 2019 or 2020, bringing the country's prices more in line with other Caribbean citizenship programs. Candidates applying under the Government donation option must agree to pay the total amount specified by the program within 30 days of receiving an Approval in Principle letter from the CBIU. Until the applicant has passed the due diligence phase and is officially approved in principle, however, they are not required to actually make the contribution. Upon formally receiving conditional CBIU approval, donations are deposited by wire transfer into a designated governmental escrow account at the National Commercial Bank of Dominica. If an application is rejected or withdrawn, the candidate will be refunded the entire deposit amount minus a small application fee within one month of the rejection or withdrawal. If the application is successful, the money will be removed from the escrow account by the Government only after an Oath of Allegiance has been signed before a Notary Public and naturalization certificates as well as passports have been issued to the principal applicant and their family. Dominica is one of the most beautiful islands in the Caribbean with perfectly unspoiled nature - emerald green mountain sides cascade down to sensational coastlines and the mild Caribbean ocean. The island has 365 rivers, one of the largest thermally active "boiling lakes" in the world, an abundance of exceptional hot springs, and a wealth of coconut trees and bright tropical flowers. As people discover the amazing hiking, diving, bird watching, and other ecotourism activities offered on the volcanically active island, the number of tourists visiting Dominica each year continues to rise. Growing alongside the tourism industry, foreign ownership of real estate in Dominica has increased rapidly over the past few years. Americans are retiring to the country in record numbers, drawn to the islands natural beauty and peaceful way of life, and businessmen and businesswomen from around the globe are strategically investing in Dominica luxury resorts, particularly individuals from China, Russia, and the Middle East. There are several Commonwealth of Dominica citizenship program authorized real estate projects currently under development in the country. One of the most promising is the secluded Cabrits Resort Kempinski by Range Developments, which will be a sensational luxury hotel with astonishing panoramic views of both the ocean and mountains. Another notable Dominica real estate development is the prestigious Tranquility Beach by Sunstone Incorporated, which will be an environmentally-sensitive resort with a world-class spa, wellness center, pool, and restaurant, all located on a gorgeous 4-acre plot of coastal land. Both of these CBIU approved real estate projects offer fractional ownership optimized specifically for citizenship by investment candidates. To officially secure an interest in a Dominican resort project in accordance with CBIU regulations, economic citizenship candidates simply make a 10% deposit towards the property and execute a sale & purchase agreement. Once approved in principle for Dominica citizenship, the investor then has seven days to pay the remaining balance of the investment, at which time he or she will be issued an Ownership Certificate. This certificate is then presented to Dominica authorities to formally demonstrate that the approved real estate investment criteria has been met in full. Purchasing fractional ownership in a Dominica resort project accredited by the citizenship program is fast and easy, requires no maintenance or upkeep on behalf of the investor, and based on the developer's income and capital gain projections will typically be expected to return enough money after five years to cover both the capital invested as well as all fees originally paid. 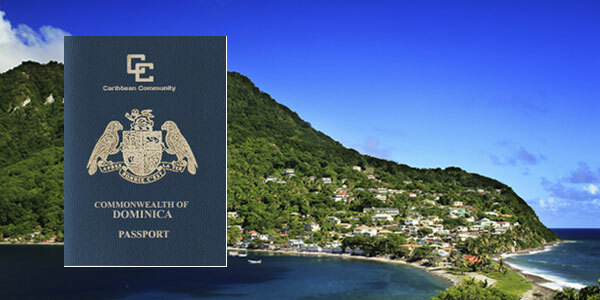 Upon prudently fulfilling all of the above requirements, a foreign national is eligible to gain full, legal citizenship in the Commonwealth of Dominica for themselves and their family. Once approved by the Dominica Citizenship by Investment Unit, applicants are issued a Certificate of Naturalization and will receive their new passport within a week via courier. Once an investor has become a Dominica citizen, they can pass their nationality on to future generations by descent. Interested in learning more about Dominica investment citizenship? Contact us for a confidential consultation. Dominica has a special government agency within the Department of Finance that handles all matters regarding economic citizenship including management and adjudication of applications, enforcement of regulations, and marketing of the program abroad. This entity is called the Dominica Citizenship by Investment Unit (CBIU), and the outcome of all nationality applications is at the sole discretion of the CBIU director and senior examiners. The first step towards procuring a Commonwealth of Dominica passport is to contact an Authorized Agent of the Caribbean economic citizenship program. It is not possible to submit an application directly to the Dominica Citizenship by Investment Unit (CBIU) - only authorized CBIU agents can present new citizenship applications under the program. Before an accredited individual or company will accept a new investor client, he or she will customarily perform some basic due diligence on the potential client and will walk them through the entire process from start to finish. If no issues surface during initial due diligence, the investor can retain the services of the agent who will then prepare and submit a citizenship of Dominica by investment application on their behalf. As part of this process, the immigration professional will also handle all auxiliary documentation preparation and validation, and can even arrange the professional translation of foreign language documents into English. To begin the application process for Dominica citizenship by investment, a foreign national must sign a retainer agreement with their authorized representative initiating a client-professional relationship and ensuring the confidentiality of their private documents and information. Due at this time are the agent's professional service fees, as well as Government due diligence, registration, and application fees. The professional fees charged by the Authorized Agent vary in amount depending on the complexity of the file, with family applications costing more than single applications. Additional Government application fees are only required of candidates applying for Dominica economic citizenship under the real estate option - people making a qualifying contribution to the Government fund do not need to pay any additional Government application fees. Registration fees consist of a standard Government processing fee of USD $3,000 per application, a naturalization fee of USD $750 per applicant, a passport fee of USD $60 per applicant, and a stamp fee of USD $15 per applicant. There is also an additional cost of USD $1,200 if you would like to be issued an expedited passport. By thoroughly vetting all applicants to ensure individuals involved in organized crime, money laundering, or terrorism are not able to buy Dominica citizenship, the country is protecting the value of their nationality which is in the best interest of all current and future Dominica passport holders. Upon receiving a new citizenship by investment Dominica file, it takes the Government approximately 60 to 90 days to fully process the application and complete the necessary due diligence procedures. Dominica does not require foreign nationals applying for citizenship to attend an interview, and during this time all correspondence with the Government will be managed by the licensed broker on the client's behalf. After clearing due diligence, the client will be issued a CBIU Letter of Approval in Principle and must now make the prescribed investment by either completing the purchase of approved real estate or wiring the relevant financial donation to the Government. If any issues arise during the application process, the local agent will liaise with Dominica immigration officials on behalf of the client in an effort to overcome the dilemma. Once the CBIU verifies that the appropriate investment has been actualized in its entirety, a signed and notarized Oath of Allegiance will be submitted to the Ministry of Foreign Affairs, Immigration and Labour. Upon approval by the Prime Minister of Dominica, the client will be promptly issued a Certificate of Naturalization and will receive a Dominica passport within seven days. If implemented, this will be the new cost of 2020 Dominica citizenship when making a monetary Government Fund contribution. Although not originally scheduled to go up, prices for Dominica citizenship by real estate investment could also increase. What is the Total Cost of Citizenship for an Individual? The minimum price for a single applicant to buy citizenship in Dominica, including all fees, is broken down below. What is the Total Cost of Citizenship for a Family of Four? The minimum price for a family of four to buy citizenship in Dominica, including all fees, is broken down below. Please note: the above calculations are for a family of 4 consisting of the main applicant, spouse, and two children below the age of 12. Contact us today for assistance determining the total cost of Dominica nationality for your family. One of the primary reasons why people buy a second passport is to free themselves from absolute dependence on a single country. It is common advice to diversify financial investments across a variety of markets, asset categories, and industries, yet many people do not spread their political risk beyond their current jurisdiction. A second passport offers economic as well as political diversification and is the ultimate emergency backup plan. Another popular reason to buy a second passport is to make international travel easier and more private. Even if you are a trustworthy and wealthy business professional or important Government official, it can be extremely difficult to travel internationality if you hold a passport from a country with domestic security issues, a substantial number of low-income residents, or foreign policy challenges. Traveling with a Dominica second passport empowers a person to visit most developed countries without the hassle of first applying for a visitor visa, and this increased international mobility can really improve a person's quality of life. Whether a person wants to attend a business meeting in Hong Kong, take a vacation in Switzerland, visit a child going to university in the UK, or go to a medical hospital in Singapore, a Dominica passport can facilitate fast and effortless travel all over the world including the entire European Union (EU) and Europe Schengen Area. Even when visiting a jurisdiction that requires Dominica citizens to first attain a tourist visa, Dominica passport holders may be in an advantageous position compared to people of other nationalities as they may face less stringent visa application conditions. Holding citizenship in a Commonwealth country such as Dominica can also make it easier to procure a business visa or residence permit in many other Commonwealth countries such as Canada or Australia. Do I Have to Live in Dominica? There is no residency requirement whatsoever to obtain Dominica citizenship through investment, and applicants are not even required to visit the country a single time. Once a person has acquired Dominica nationality, there is also no obligation to ever visit the island in order to maintain citizenship, and Dominica passport renewals are unconditionally available to all citizens at all times. Dominica is a fantastic country, however, and new citizens are encouraged to visit and are of course very welcome to live, work, or study on the island. In most cases, it is possible for Dominica economic citizenship participants to keep their newly acquired second passport a secret since the process is completely confidential and there is absolutely no disclosure of information unless required for due diligence purposes. The country fully recognizes dual citizenship, which means the Government of Dominica will never force a person to renounce their existing citizenship in order to be granted a new nationality, and will never exchange information with foreign governments. The names of successful citizenship by investment candidates in Dominica will also never be published publicly. The Government of Dominica even allows people to legally change their surname via a Deed Poll procedure once they have been a citizen for more than one year. Please note: although Dominica dual citizenship is permitted, a person's current country of citizenship may have restrictions prohibiting them from possessing a 2nd passport. A citizenship by investment Dominica passport is valid for ten years at a time, and can be renewed for life since citizenship in the country is never revocable under any circumstances. Dominica passports issued to children under 16 years old are valid for a duration of 5 years. Even if the Caribbean economic citizenship programme eventually closes, anyone granted citizenship under the scheme will forever retain their second nationality and passport providing free international travel to 119 countries and territories around the globe. An expired or expiring Commonwealth of Dominica passport can be easily renewed for a small fee at any Dominica consulate, embassy, high commission office, or at the Dominica passport office in Roseau, the nation's capital. Damaged or stolen passports, or passports with no free visa pages left, can also be replaced by any consulate, or by the passport office. The licensed local promoting agent of the Dominica Economic Citizenship Program that originally guided you through the application process can also help facilitate the renewal of your passport. There is no need to have a Dominica address in order to renew your passport - you can use your primary residence elsewhere without a problem. Dominica offers global entrepreneurs a favorable business development environment and generous tax regime. Citizens of Dominica that do not reside in the country enjoy a tax-free status on all foreign income and capital gains and are not liable for any gift, wealth or inheritance taxes in the country. The island offers a variety of other tax incentives and advantages as well, including no restriction on the repatriation of corporate profits or imported capital, generous export allowances, duty-free trading in the Caribbean, and full exemptions from import duties. The Dominica offshore banking industry is expanding swiftly, and a growing number of people interested in incorporating an IBC in the Caribbean are considering a Dominica offshore company formation. The Government has been investing a large quantity of resources into improving the island's financial sector, and the increased interest in opening a Dominica offshore bank account is likely a testament to this new infrastructure policy. We believe the Dominica citizenship by investment program offers better value to investors than any other economic citizenship program in the world. There are many different investor immigration and citizenship by investment programs available today. Malta, Cyprus, Bulgaria, Austria, Hungary, Antigua and Barbuda, St Kitts and Nevis, Saint Lucia, and Grenada all offer investment citizenship programs in various forms. Canada, UK, Australia, New Zealand, Singapore, and the USA offer investment immigration programs, and Spain, Portugal, Greece, and Latvia offer EU investor visa schemes. A second citizenship is much more valuable than an investment visa, however, and investor immigration programs do not provide an instant second passport. The Dominica Citizenship Program offers an excellent second citizenship and powerful second passport at a much lower cost than investment citizenship programs in similar jurisdictions. Many industry experts consider Dominica the cheapest and easiest second passport amongst reputable citizenship by investment countries. The efficient and well-structured program makes Dominica potentially the easiest country to gain citizenship through investment, provided you are an investor with no criminal record and a good reputation. The Commonwealth of Dominica is an island country located in the Lesser Antilles region of the Caribbean Sea. Discovered by the Spanish, primarily colonized by the French, and then controlled by the British for more than two centuries, English is the official language of the country and the nation's legal system is based upon British common law. The tiny country of just 70,000 people became an independent nation in 1978 and remains very close with the United Kingdom today. Roseau, the capital city, accounts for roughly 20,000 of the country's population and is the financial center of the country. There are several distinguished educational institutions on the island including the University of the West Indies, Ross University School of Medicine, Archbold Tropical Research and Education Center by Clemson University, and the All Saints Medical University. The local population of Dominica is mainly of African descent, with a small indigenous Carib population and an increasing Middle Eastern, Caucasian, and Chinese population. Dominica is a member of the United Nations, International Monetary Fund, CARICOM, Commonwealth of Nations, as well as the Caribbean Development Bank (CDB). The nation has diplomatic missions in Washington DC and New York (USA) as well as Havana (Cuba), London (England), Brussels (Belgium), and Beijing (China). There are also Dominica consulates in Zurich (Switzerland), New Delhi (India), Ottawa (Canada), and Casablanca (Morocco). The country's currency is the Eastern Caribbean Dollar (EC$ or XCD), which is pegged to the American Dollar at the consistent exchange rate of $2.70 XCD to $1.00 USD. Having a stable currency tied directly to the US Dollar eliminates a sizable risk frequently faced by people making foreign investments, and the consistent exchange rate can make planning an exit for a real estate investment on the island much less complicated. Please note: all financial transactions related to the Dominica Economic Citizenship Program are exclusively in US Dollars. Nicknamed the "Nature Island", Dominica is arguably one of the most beautiful places on earth with an unspoiled rainforest, staggering coastline, and a number of natural hot springs thanks to its volcanic origin. It is often said that if Christopher Columbus returned to the Caribbean today, Dominica would be the one place he would still recognize as the island's stunning landscape has largely remained untouched. Despite an area of only 750 square kilometers, Dominica is an outdoor adventurist's dream with over 40,000 acres of national parks and forest reserves, 365 different rivers, and animals that are entirely unique to the island such as the rare Sisserou parrot which is pictured on the country's flag. The island is so beautiful in fact, that its Morne Trois Pitons National Park has been designated a UNESCO World Heritage Site. Thanks to its safe and stable environment and abundance of natural splendors, it is not hard to understand why the country has been named as one of the world's happiest places to live. To learn more about Dominica, you can visit the official Government of Dominica website here. Agriculture has long been the country's economic mainstay, with banana production directly or indirectly employing more than one-third of the island's workforce. In the past decade, however, the Dominica financial services industry has increasingly become the principal economic generator in the country, and as the Dominica offshore banking sector continues to grow, coffee and banana exports will become a much smaller percentage of the national gross domestic product (GDP). Fishing also plays a fairly important role in the local economy employing approximately 2000 people, while forestry and mining provide a limited number of jobs in the country. The Dominica GDP per capita is currently $14,800 USD. The Dominica citizenship investment program offers successful participants virtually all the same rights as people who were born on the island, including the right to vote in political elections. How Does an Official Dominica Citizenship Agent Help? Authorized local promoting agents of the citizenship by investment Dominica program ensure the correct completion of the client's application form, help prepare all the requisite supporting documentation, and handle all correspondence with the Government on behalf of the applicant. Economic citizenship in Dominica is only available through an authorized agent of the program. Many CBIU authorized agents are licensed lawyers, most of which were educated in Canada, the United States of America, or Europe. Should I Buy Dominica Real Estate or Donate to the Government Fund? Investment citizenship Dominica applicants can meet the program's financial requirements by either buying approved real estate in the country or by donating cash to the Government Fund. Neither option is necessarily "better" than the other, but both can offer certain advantages over the other. In general, solo applicants often qualify for Dominican citizenship by making a donation while families often purchase real estate in the country. To help you do a cost-benefit analysis of each option to determine its feasibility, we have listed the pros and cons below. The primary benefit to becoming a Dominica citizen by making a donation to the Government Fund is that it requires less money, especially for individuals applying alone. A single applicant can qualify for a Commonwealth of Dominica passport after they donate $100,000 US dollars, making it the cheapest second passport program available today. This same solo applicant would need to spend a total of $225,000 US dollars if going the real estate route - $200 thousand towards a property on the island and $25 thousand for Government fees. A husband and wife and their two children (under 18 years of age) can qualify with a fund donation of $200,000 USD as opposed to a total cost of $235,000 if buying real estate. Although the real estate option will likely work out to being cheaper upon selling the property, the opportunity cost of the increased upfront expenditure may counteract the savings realized when the original purchase amount is recuperated. By far the biggest advantage to satisfying the investment criteria of the Dominica citizenship scheme by purchasing property is that the expenditure is recoverable and not a sunk cost. 36 months after you purchase sanctioned real estate in the country, you have fulfilled the investment citizenship obligation and are permitted to sell the unit. The amount of money you must spend buying Dominica property in order to get a passport is also extremely low compared to other citizenship by investment countries in the region that typically require a real estate purchase of at least $400,000 USD. The Dominica Economic Citizenship Program recently reduced the Government fees for the real estate option. In 2019 or 2020, it is also likely that the Government Fund donation criteria will significantly increase as originally scheduled for August 1, 2016. The Dominica citizenship by real estate investment requirements may not increase, however, making the option to buy Dominica property even more attractive. In many situations, the total cost of acquiring a Dominica passport by investment in real estate is comparable to the amount the applicant would need to donate to the Government Fund. Consequently, the Dominica citizenship by investment real estate route can offer fantastic value when compared to the contribution route, as much of the investment can be recovered. For example, a primary applicant and their husband or wife and two children could satisfy the investment requirement by buying $200,000 in real estate and spending $35,000 on Government fees for a total cost of $235,000 - the majority of which is recoverable after three years. Had the couple gone the direction of the Government Fund contribution, they would save $35,000 at the beginning but none of the $200,000 investment would be recoverable. Some international residence and citizenship advisory firms have claimed that regardless of the jurisdiction, citizenship by investment program approved real estate is "always overpriced." Such an idea is simply false, as it does not differentiate between the increased fair market value of such properties and blatant price manipulation. People buying CBIU endorsed real estate to secure a Dominica passport are permitted to resell the property under the citizenship program after they have maintained ownership for five years. With the existence of such an exit strategy allowing investors to recuperate any premium they originally paid for their Government authorized real estate, such property investments can hardly be considered overpriced. CBIU approved projects are typically luxury resorts offering fractional ownership specifically optimized for citizenship by investment applicants. The developer of such projects is well aware that most investors will sell their holding after five years and therefore structures the investment so that its projected appreciation after 60 months more than covers all of the original costs and fees incurred by the buyer. As demand for Dominica investor citizenship flourishes, CBIU approved real estate will likely appreciate in value much faster than non-sanctioned property. Effective June 1, 2015, Dominica passport holders no longer require a Schengen Visa to visit EU countries, which many offshore financial planning experts believe effectively doubled the value of the travel document overnight. Although no such plans have been formally announced, many industry veterans believe it is now only a matter of time before the Dominica citizenship real estate investment requirements increase significantly. If the minimum real estate purchase amount rises, it is reasonable to assume that the value of all existing projects approved under the investor program will instantly jump. This means that 2019 is an exceptional time to invest in Dominica real estate that is approved by the CBIU. What Happens if the Dominica Real Estate Market Crashes? Both the Commonwealth of Dominica passport program and the Dominica offshore banking industry are growing briskly, so the chance of the local real estate market softening anytime soon is remarkably low. This being said, in the current period of global financial uncertainty and volatility, smart investors can never rule anything out for certain. Let us analyze the "true cost" of citizenship of Dominica procurement under the real estate option given a complete meltdown of the country's property market. First of all, future economic citizenship Dominica participants must meet the program's minimum purchase amount when buying real estate. This means that if the country's investment criteria ever increase, more money will likely enter the market regardless of macroeconomic trends, supporting price growth of approved real estate even in a bad market. Secondly, luxury home prices on the island are primarily determined by international buyers, not domestic ones, which means that a global recession is a much bigger risk to the local housing market than a domestic one. In theory, however, global economic instability would increase interest in second passports from stable jurisdictions selling nationality, raising the demand for CBIU sanctioned property and insulating the investment from negative market forces. The most obvious scenario where someone could potentially lose money investing in real estate under the Dominican citizenship program would be when an investment is liquidated less than five years after the original purchase date. In such a situation, the real estate investment would not be eligible for resale under the scheme and would lose any associated premium. Even if the value of the investment crashed, however, the cost of Dominica citizenship is still reasonable. If a foreign national purchased $200,000 worth of real estate and it dropped in value 50% by the time they sold three years later, the real cost to buy Dominica passports for the main applicant and their spouse would still only be $135,000 including Government application fees. This is still $40,000 less than the amount they would have needed to donate to the Dominican Government Fund had they gone the direct contribution route. How Many Dependents Can Be Included in a Single Application? An economic citizenship Dominica application can include an unlimited number of eligible dependents, allowing every investor to include their whole family regardless of how many children they have. While there is no numerical limit on the number of dependents that can gain citizenship together via the Dominica program for investors, only people fully supported by the principal applicant are classified as suitable. The maximum age for dependent children has been increased to 28 years, making it one of the highest in the citizenship by investment industry. The minimum age for dependent parents or grandparents has also been reduced to 55 years of age. What Family Members Can Be Considered Dependents? According to program regulations, a child can be either biological or legally adopted. Before passing due diligence, there is no guarantee that a family seeking to buy citizenship in Dominica will be automatically accepted even if they are immensely wealthy. Donations made towards the Government Fund will always be placed in an escrow account, however, so if an applicant happens to be issued a refusal by immigration Dominica authorities for any reason, their contribution will be hastily refunded in full minus a small Government application fee. When shopping around for a second passport, it is important to assess the integrity of each jurisdiction and citizenship by investment program. There are several countries where you can buy citizenship, but not all of these second citizenship programs are equal. Before you ever buy citizenship in another country, you should do your research. Economic citizenship countries that do not maintain strict quality control over their passport programs, or who fail to effectively implement efficient risk mitigation strategies within their due diligence process, can potentially damage the power of their passport in the future. In order to protect your investment, you should only ever consider economic citizenship programs in jurisdictions that you fully trust to preserve the long-term value of their passports. Although Dominica is a cheap citizenship by investment country, they do not skimp on compliance measures, and their due diligence process is top notch. As part of the application procedure, a leading private investigation agency submits a confidential due diligence report on the applicant directly to the Dominican Government. The CBIU then considers the findings of this comprehensive report when determining if the individual is a diserable candidate. The economic citizenship Dominica program is both well-established and greatly respected and has been in operation for more than 20 years. Highly rated by the international community and skillfully managed by industry leading professionals, securing a Dominica passport through the nation's reputable citizenship scheme is a secure and strategic investment for life. The price to obtain Dominican citizenship is so cheap some people worry that it is not legal and that they are actually buying a fake passport. Although the program's investment benchmarks are substantially lower than those of many other citizenship by investment schemes, the Dominica Economic Citizenship Programme is 100% legal, and successful applicants end up gaining a bonafide Dominican passport, not a counterfeit or stolen one. International business people looking for Caribbean investment opportunities should also consider investing in Dominica as the country is actively courting foreign investment through progressive policy reform, minimal taxation, and the creation of improved legislative and fiscal framework. Although the Caribbean has a reputation as a tropical paradise with charming people, marvelous beaches, and crystal clear water, it is also known as a place where business moves notoriously slow. This stereotype certainly does not apply to the Dominica Economic Citizenship Program, however, as the program is terrifically fast and efficient and many of the authorized agents have professional experience in the fast-paced business environments of North America and Europe. The Dominica citizenship by investment scheme also has a stellar reputation for honesty and transparency, and applicants will never be asked to pay a bribe as part of the process or to improve their chances of receiving governmental approval. Wondering how to get Dominican citizenship by investment, and if it is legal? The process to obtain a second passport Dominica through the economic citizenship Caribbean program involves making an adequate investment and paying the required CBIU Dominica fees. Buying a second passport Dominica is made legal by the nation's citizenship by investment legislation, and typically takes less than 6 months. To begin the process, you must contact a CBIU authorized agent. Official Dominica citizenship by investment policy and legislation is always subject to change without prior notice, but registered agents licensed to submit nationality applications on behalf of investors will always be up-to-date on new program modifications or adjustments. For example, the program used to require personal interviews, but applicants no longer need to attend a mandatory interview unless requested at the discretion of the CBIU. Since Dominica permits dual nationality, gaining citizenship by investment in the sovereign nation does not require you to forfeit your current passport, and privacy and discretion are assured by the Government and your Authorized Agent. The main international airport in Dominica is Melville Hall (DOM), which is where all commercial airlines land and the arrival point for most people visiting the island by air. Melville Hall Airport is located on the northeastern side of the island and is one hour from Roseau. There is also a second, smaller, international airport on the island. Canefield Airport (DCF) is located just outside Roseau and is mostly used by people arriving in the country by private jet. Most people flying to Dominica from outside the Caribbean connect to the island through airport hubs in Martinique, Antigua, St. Maarten, Puerto Rico, Barbados, or Guadeloupe. Dominica flights are offered by Seaborne Airlines, Win Air, Hummingbird Air, LIAT Airline, and Air Sunshine. Dominica is a highly popular destination for cruise ships, with hundreds of thousands of cruise ship tourists arriving in the country each year via the Cabrits Cruise Ship Berth, Roseau Cruise Ship Berth, as well as Woodbridge Bay. Large 300 to 400 seat catamarans also regularly travel between Dominica and neighboring countries such as Guadeloupe, Martinique and St. Lucia. Yachts and sailboats also regularly visit the country, and Dominica has many great ports including several that can accommodate luxury yacht charters. Will My Future Children Get Dominican Passports? New children of successful Dominica Citizenship Program participants are eligible to also become Dominica citizens, with no additional investment required. There is a USD $2,000 Government processing fee to add a newborn as a citizen of the country, however, and the child must be under the age of five. Supporting documents that are not in English must be translated by an accredited professional translator and duly notarized. A parent or legal guardian must sign for all applicants less than 18 years old. A personal reference must know you for at least five years, and must not be a family member. Professional references must be acquainted with your work for a minimum of three years. A bank recommendation letter should be signed by a senior bank official and should contain full contact information for that institution. Application letters stating the reason for applying for investment citizenship in Dominica should always be addressed to the Honorable Prime Minister. An original police clearance certificate should be provided by a law enforcement agency for all persons older than 16, and should include a set of fingerprints. For kids aged 12 to 15, a sworn affidavit by the parent confirming that the child does not have a criminal record is required. A notary public should endorse all passport photos with a statement that says "I certify this is a true likeness of" followed by the person's name. The following Dominica offshore banks were registered with the National Financial Services Unit (FSU) as of January 2019. Please note: just because a Dominica offshore bank is listed above does not mean that we in any way officially endorse it. The above Dominica offshore banks are taken straight from the FSU website and listed in alphabetical order. Please also be aware that some of these offshore banks may be considered by the Dominica Financial Services Unit as non-compliant with regulatory standards and could have their licenses revoked in the future. Is the Dominica Passport for Sale? News media publications occasionally claim that people can "buy Dominica citizenship" when reporting on the country's investor immigration program. Because a monetary contribution is one of the investment options under the program, journalists seemingly mistake the legitimate Dominican citizenship through investment program with a Dominica passport for sale one, and therefore claim the program is no different than a Dominica citizenship for sale scheme. The fact is, economic citizenship in the Commonwealth of Dominica is well regulated and completely legal, and the concept of offering a fast track to nationality for foreigners willing to invest in a nation is totally different than outright selling passports. Interested in how to become a Dominican citizen? Contact us today. Due to their similar names and geography, some people mistake the Commonwealth of Dominica with the entirely unrelated country of Dominican Republic. They are not the same! Although both countries have fantastic weather and beaches, there is no Dominican Republic citizenship by investment program, and to the best of our knowledge the country does not offer any form of investor visa. For this reason, we must assume that most people searching for the Dominican Republic citizenship by investment program are in reality looking for the Commonwealth of Dominica Economic Citizenship Program - one of the oldest and most famous second passport programs in the world. Please note that the Dominican Republic passport is also substantially less powerful than the Commonwealth of Dominica passport, and does not offer visa-free travel to any EU countries. For this reason, even if a Dominican Republic citizenship by investment scheme existed, it would not be nearly as attractive for international travelers. Dominica second citizenship can make international travel to the European Union significantly easier. Without a Dominica passport, non-EU or EFTA nationals may require a Schengen Visa in order to visit European countries such as the United Kingdom or Germany. Dominica's instant citizenship program offers tremendous value to investors, however, and with a Dominica second passport business professionals can easily travel to the EU without requiring a UK Visa or Schengen Visa. As of January 2019, Dominican citizens are able to travel to Russia without a visa. This makes Dominica one of the few citizenship by investment jurisdictions with a passport that provides visa-free access to Russia. The Dominica investment citizenship program is open to reputable individuals of all nationalities. After Hurricane Maria devastated Dominica in September 2017, the country significantly reduced the Government processing fees for the real estate purchase option. Under the investor citizenship program, a single applicant who buys Dominica real estate now pays a $25,000 fee as opposed to $50,000. A family of four who makes a qualifying property investment now pays only $35 thousand in Government fees compared to $75 thousand previously. This discount is temporary, and the citizenship by investment program's fees will likely go back up in 2019 or 2020. Does Making the Investment Guarantee Citizenship? The economic citizenship Dominica program is structured so that investments do not have to be made in full until after an individual or family has been accepted in principle. To apply for Commonwealth of Dominica citizenship by investment and receive approval in principle, an investor simply has to execute a real estate sale and purchase agreement or agree to donate the prescribed amount of money to the Government Fund. He or she does not need to actually purchase the real estate or make the donation in full until after they have been authorized in principle by Dominican immigration officials. As an additional layer of protection, the Government Fund donation is held in an escrow Dominica bank account and cannot be touched unless the application is withdrawn, rejected, or approved. If the application is withdrawn or denied, the investor receives a refund, and if it is approved the Government will not withdraw the money until after Commonwealth of Dominica passports have been issued. For a confidential consultation regarding Dominica citizenship by investment, phone us today or use our contact form to request a call back. All information will be treated as highly confidential once received by our team! © 2019 Dominica Citizenship by Investment. All rights reserved.